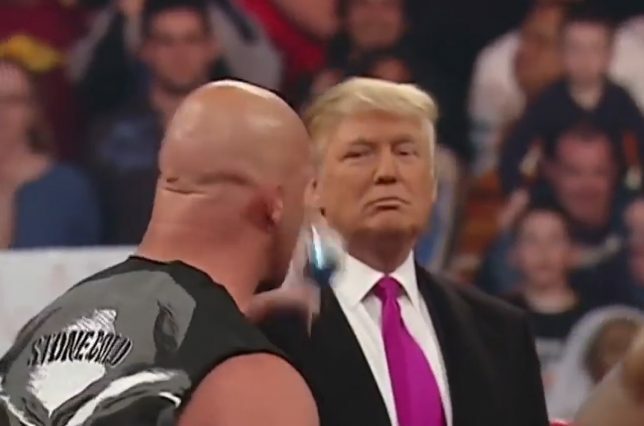 Pre-presidential Donald Trump with "Stone Cold" Steve Austin at WWE years ago. What if the public feud between President Donald Trump and Attorney General Jeff Sessions feud is one huge put-on? That’s the question Brian C. Joondeph asks in a thought-provoking column at American Thinker today. President Donald Trump has been attacking his attorney general, Jeff Sessions, daily. There have been brutal attacks on Twitter, in media interviews, and during speeches. Conventional wisdom is that Trump is getting ready to fire Sessions or hoping Sessions resigns.Conventional wisdom also assured everyone that Hillary Clinton would win in a landslide, the only question being by how large a margin. Trump’s complaint is that his attorney general should not have recused himself from the Russia hacking hoax and that he is dragging his feet on long overdue investigations and prosecutions: Deep State leaks; unmasking; DNC and Clinton collusion with the Ukrainians; Hillary Clinton’s reckless email management, including tens of thousands of missing emails; the Clinton Foundation Russian uranium deal; and all the mischief and criminality left over from the Obama administration, perpetuated to this day by the Deep State imbeds. These are reasonable complaints. After all, Trump promised to drain the swamp. Special Counsel Robert Mueller’s investigation is leaking like a sieve. Most of the daily news originates from Deep State leaks, much of it illegal but given a pass by the Justice Department. Additionally, how could Sessions continue to work for a boss who is publicly berating him? Who of us would put up with that in his job? Sessions could easily say the heck with Trump and his endless criticism and quit. He has had a good career. Why would he want his last and most prestigious government job to be constantly whipped by his crazy boss? All good observations. All good questions. The feud — if that’s what it is — seems contrived, much like the brutal, expletive-filled interview new White House Communications Director Anthony Scaramucci gave the New Yorker in which he savaged Reince Priebus and Steve Bannon. Just today Sessions sounded like someone suffering from battered spouse syndrome, complaining about Trump’s behavior yet making excuses for him. “Well it’s kind of hurtful, but the president of the United States is a strong leader,” Sessions told Tucker Carlson on Fox News Channel. “He is determined to move this country in the direction he believes it needs to go to make us great again, and he has had a lot of criticisms — and he is steadfastly determined to get his job done and he wants all of us to do our jobs and that’s what I intend to do,” the attorney general said during a visit to MS-13-plagued El Salvador. As Joondeph points out, it would be so much easier for Trump to fire Sessions or for Sessions to resign. But that’s not happening. All of this is like the play-acting at a wrestling match, and Trump has plenty of acting experience. Remember when he shaved WWE chief Vince McMahon’s head? Maybe this is Trump’s unusual way of trying to wrest back control of the narrative from the mainstream media. But it feels so fake.